I don’t know Paul Peterson. His story -- the unwanted underdog -- is great, but that is not why he is my favorite BC athlete of all-time. In honor of his and his wife’s recent graduation, I thought I would write one final tribute to him. I was only eight during Doug Flutie’s run at the Heights. While I remember the Miami game and have watched his BC games on ESPN classic, I didn’t really live through them as a diehard fan. Paul Peterson might be as close to Doug Flutie as I’ll ever get. While his accomplishments don’t measure up to Flutie’s, his success and style of play -- given his surroundings -- made Peterson’s nearly as special. I became a BC student in the fall of 1994 and have watched every game since. In that time we have had some quarterbacks who showed flashes of brilliance and pro potential, but all still played safely within the system. We also had our share of robotic stiffs. Peterson was different. Whether it was his age and JUCO experience or his need to compensate for his size and arm strength, Paul saw the field differently and made choices his predecessors did not. When he first arrived you heard reports of things being different, but TOB and Bible still went with Quinton Porter (who fit their prototype). Peterson saw limited play but couldn’t (or wasn’t given the chance to) unseat Porter. When Quinton went down with an injury, and the season on the brink Peterson played well in a comeback win against Rutgers. This is when I started gaining confidence, but it was the next week against Virginia Tech where he confirmed he was something special. BC was a heavy underdog going into Blacksburg. The team was playing well and Peterson was making the plays to keep drives alive. Then he rolled right on a scramble and flung a ball to Grant Adams in the endzone. A 30-yard TD should not be a big deal, but I jumped off of my couch. That was not what was supposed to happen to BC during broken plays. Prior to Peterson, everyone would come back toward the QB to bail him out. With Peterson, it changed. He turned broken plays into big plays. And had the confidence to take a risk. BC football was exciting again. Peterson kept up this style of play through the end of the 2003 season and the start of the 2004. Then Wake Forest. He moved the ball, but we just couldn’t get it in the endzone and missed three back-breaking field goals. Wake made a fluke play late in the game to take the lead and eventually win. I was sitting there, stunned and disappointed. As the players walked into the locker room, one guy remained on the field -- Paul Peterson. He was crouched with his helmet in his hands. For the first time in a long time, it looked like a player cared as much as I did. I am sure others have cared more, and as a spectator, I don’t claim to get as emotionally of physically involved as a player. But seeing Paul share my frustration connected with me more than taking a class with a player or hanging out with one in my mod. The season progressed, with its share of highs (Notre Dame) and lows (Pitt and Syracuse). Regardless of how many clunkers he might have thrown or my frustration with other parts of the team, Peterson made the games fun and gave me the confidence we were never out of it. When I started this blog around the holidays, I wrote about how I skipped the Tire Bowl out of frustration with the Syracuse loss (in which Peterson did not play). At the time it seemed like the team looked past the Orange or missed the Peterson’s leadership. Well, I decided if they didn’t care, I wasn’t going to care. Of course I still watched the game. I regret missing it in person, because it summed up what made Peterson so special. Although his hand was still hurting, he moved the ball effectively and kept the team in the game. Then, while scrambling, he lost the ball due to the same injured hand. Staying poised, Peterson fell on the ball and got trampled. Broken leg. Season over. Game over. College career over. Many guys would have pouted or at least focused on the injury. But there was Paul watching the jumbotron and cheering as the team converted a fake kick into a touchdown. Big smile on his face. It wasn’t the Flutie pass, but it was a dramatic end to a great run. Paul, thank you for the joy you brought to this fan. Thank you for making the games exciting. Thank you for caring. Your BC career was too short, but I will certainly remember it fondly. Don’t give up your dreams. (Doug Flutie didn’t stick in the NFL until his mid-30s.) Best of luck to you and Meghan (whom my friend Logitano met at Temple. His assessment: “She’s hot”.) As you follow your path I know you will continue to exemplify our alma mater’s motto -- Ever to Excel. A few things of note for Friday morning. Sean Williams has a history of trouble. This won't help his cause to be reinstated at BC. Gordon Watt is headed to Purdue. Best of luck to him. In BCS news, it looks like the coaches' votes will be public. The new Yawkey Center is getting rave reviews. Hopefully our Boston correspondent can get some pics before the public. In other news, McClain's lawyer is claiming that Akida is innocent. What would you expect his lawyer to say? Monday was commencement at Boston College. I planned on posting my love letter to the graduating Paul Peterson. Instead I have to chime in the Sean Williams disaster. Sean Williams blew it. There may be more to the story over the next few months. He may get his second chance at BC or another school, but this will follow him. This seems like a minor thing (my friends and I did things like this or worse while at BC) but for someone like him -- a promising athlete with a lot at stake -- this was a bad move. The student athlete is held to a higher standard than the regular Joe BC. Others may view this as a double standard but there is a reason for the statement. Most BC students are not public figures. Most BC students are not given as much slack in the classroom. And the biggest difference, most BC students are not recipients of University funded scholarships. These skills/burdens and gifts come with a quid pro quo -- perform and keep your nose clean and the jock will get a platform on which to be seen and an education and network foundation that will last a lifetime. In Sean Williams’ life, if he works hard and gets better, his talent will prevail. But that may not happen at BC. Since Jim O’Brien’s departure we have not given too many second chances. And now this looks like Al Skinner may be losing control of the team: McClain last week, Watson during the season and Ryan Sidney and Andrew Bryant two seasons ago. Williams may be the sacrificial lamb. Regardless, Al is going to be under a much closer watch. What does this mean for the team? If he doesn’t return, it is certainly a step back. The lineup can be shuffled, but big things were expected for Williams' sophomore year. I’ll still cheer for the kid and hope he gets his act together. TRay and the Evil A and I used to joke that we would love BC to become a UNLV-type environment. But in reality this is embarrassing. I don’t want my school going through this stuff. I see it all the time down here in the SEC, and it really takes away from the whole college sports experience. Regardless, I always cheer for BC. Hopefully I’ll be cheering for Sean Williams too. Look for the interrupted Peterson tribute later in the week. On a more personal note, congrats to the Entropy Kid, good friend, fellow BC alum and blogging powerhouse. He just added a Mrs. Entropy Kid and hosted friends and family from around the country in a lovely wedding in California. I hope he is reading this from his Hawaii hotel room. Looks like Akida might not be in big trouble over the fake money thing. With the trouble that Ryan Sidney and Andrew Bryant got into, I think it would be best for Al to cut any losses and tell the kid to find another school. Great find from TRay on Akida McClain passing bad money off at the Dollar Store. This ends his career at the Heights. No big loss to the team. Hopefully he can get his act together. Craig Smith made the smart move and decided to skip the NBA draft. I think Craig will have a tough time in the NBA. He is too small to play inside and his outside shooting is not strong enough. And his defense is so, so. Finally, it looks like the ACC runner up will still go to the Gator Bowl. If BC ever makes it, I'll be there. However, going to Orlando would be cool. Amelia Island is beautiful. Mrs. ATL_eagle and I spent a long weekend there last December and will be back this year the same weekend as the ACC Championship in nearby Jacksonville. Although we’ll be there for business, we might still go to the game. I think BC will have a hard time selling all of its ticket allotment. While many of the ACC writers were also in Amelia, the Boston papers were MIA. Here are some articles of note from the past week. The AJC’s Tony Barnhart writes about the nuances and challenges of the oncoming divisional play. I get the ESPN Gameplan; According to Tony’s other report, it looks like I’ll have a lot of ACC football from which to chose. The AJC also had an interesting piece on the steps college coaches take to keep their athletes out of trouble. BC fans have numerous complaints about Tom O’Brien, but for the most part his guys stay out of trouble. Jon Solomon of The State seemed to have the most comprehensive coverage from Amelia Island. His reports included this piece on the workings of instant replay. Jon also had the latest on the flag controversy in South Carolina. As long as the flag is an issue, Greenville will not host the ACC Baseball tournament. This only increases the chances of playing the games at Fenway Park. Fortunately it looks like the push for five years of playing time is losing steam. I spend an inordinate amount of time thinking, watching and reading about college sports, but I would like them to maintain some semblance of amateurism and academia. Extending playing time beyond four years would have been just another step towards official minor league status. A BC rower died Saturday in Philadelphia. Junior Scott Laio collapsed from an apparent heart attack during a crew competition. According to reports he was seemingly fit. My thoughts and prayers are with his family. Some good work coming out the Columbia State on the ACC meetings. First an article on the machinations of the second tier bowls. It appears that the Big 10, Big 12, SEC and ACC are working out deals to mix and match teams in the Florida January 1 bowls. This sort of power move from the major conferences shows why we are a long way from a playoff. The NCAA would never let them have this much control. The State also has an article on the challenges the added game puts on Thanksgiving weekend. Looks like Paul Peterson will be protected by a BC man in Ottawa. I like Kiwi, but Scout.com is getting a little overboard. And look where they slot Blackmon. Pretty high for a return man. Tim Hasselbeck signed with the Giants. Now he and his TV wife can be in the same city. Fall Questions, but disagree on the Spring Answers. No Quinton Porter rust? Fans questioning the backfield? Nine out of 10 BC fans feels better about our RBs than our QB. Entering the 2005 season, I think the wide receivers and tight ends are the most intriguing part of the team, simply for the fact that they are mostly unknown and are some of the better athletes on the team. All three of last season’s starters -- Grant Adams, Joel Hazard and Dave Kashetta -- are gone. And the trio accounted for 42% of BC’s receptions last season. I am not sure who will start this season. Given TOB and staff’s penchant for rewarding seniority, I think you could see the two seniors Larry Lester and Will Blackmon start. Interestingly both are converted defensive backs. Of the wide receivers Larry Lester caught the most balls (35 in eight games) last season. Larry is undersized but has speed. His hands are okay but he is probably best known for his overtime fumble against Pitt. He also has been prone to injury. Fortunately he has had his better games with Quinton Porter. Larry is a deep ball threat too, which we will need to stretch the offense. Will Blackmon might be the most talented athlete on the team. Too bad he was not our best corner. His mental lapses and gambles last year cost him his starting CB job. But as he shown on special teams -- when he has the ball -- that he is very allusive. His conversion to offense has been the main story of the offseason. If he can catch he can have a big season. If he can’t than he’ll only see the field on kicks and punts. Hopefully Bible will use him in the occasionally end around. Chris Miller is the projected starting tight end. He caught 20 passes (two for TDs) last year. He is serviceable but not a game breaker. I think he fill any void left by Kashetta. Then there are the unknowns. I really like JR Tony Gonzalez. He caught the game-winning TD against Notre Dame. He has never shown anything spectacular, but he has reliable hands -- which we have been lacking. Jason Lilly and Kevin Challenger have also shown potential yet have never received much playing time. Redshirt freshman Brandon Robinson was highly touted and reportedly had a strong spring. And backup tight end Trey Koziol will also see more playing time. I would like to throw the ball more this season. But given an untested receiving corp, Quinton Porter’s return, and a talent group of running backs, I don’t think we’ll see as much passing as last season. The Eagle Action forum had these two links of interest. First, a preview of the ACC meetings. It mostly discusses future bowls and hoops tournament issues. In the second item from this Globe article, Bill Griffith brings to light the aggresive stance the Fenway Sports Group is taking with WEEI and other local media. The Sox have the power in Boston and partnering with them seems like a good idea so far. And then Yahoo! News provided this short story. More Fenway-ACC chatter from Florida. The Big East-ACC lawsuits were a big mess. Since BC was the defendant I also thought the suits were frivolous. It appears the state of West Virginia did not come out ahead. I hope the voters take action. And once again, the Big East really needs to examine its leadership. The offseason can be a tough time for college beat writers. There is not a lot of news and only so many features. That said, I understand looking for things to do or say. But churning your season previews repeatedly in the spring is kind of lame. Is linking to it on your blog even lamer? It doesn't really explain BC's slight drop. The ACC and Big East announced a settlement in the Big East’s lawsuit. This officially clears any final hurdles for BC joining the ACC. What is interesting is that first report came out of Hartford (where the Connecticut AG -- who started the suit -- likes to grab headlines). Southern papers had a slightly different spin. Then the ACC came out with a rebuttal to the rumors. Spinning all around. What we do know is that the Big East settlement is $5 million or less. That won’t even cover the legal fees that the States Attorneys General have already accrued from Skadden Arps. So where is the big Big East victory? Maybe they saved some face publicly by getting a few ACC schools to agree to future dates. They have a loose hold on their BCS slot. And they were dumped by the Gator Bowl. The conference is in shambles. Thankfully, the mess is now behind BC. The basketball team is getting a transfer. Tyrelle Blair had run of the mill numbers at Loyola, but should add some depth to the frontline once Smith leaves. In other news, the Heights takes the lead over Eagle in Atlanta in the race to see who can show more love to Paul Peterson. Finally, the AJC's Tony Barnhart wrote his ACC football spring recap. Now that official football practices are wrapped up, I thought I would give my thoughts on each area of the team. I’ll start with the offensive line since that is probably the area of least concern. Offensive line play has been the foundation of TOB’s success. The strategy seems to be recruit big kids, bulk them up and coach them up. Last year was probably the most the offensive line [as a whole] has struggled in the past five years. Jeremy Trueblood dealt with nagging injuries most of the season and Cherilus got pulled periodically due to inconsistent play. Plus, as I have often repeated, I don’t think they got much help from the backfield or tight ends. SO Ty Hall (whose Dad wears the funny hat) also received significant playing time last season. If Trueblood plays well and stays healthy he could be a first-day draft pick. I think Ross also has pro potential. Hopefully both will be focused and lead the unit. There was no significant news out of this group during Spring Practices. I expect the team to run more than last season, so pressure will fall on the line. Two years together, depth and good coaching -- there is no reason they should not be able to handle it. BCeagles.com hosted a chat with TOB Wednesday. Nothing too revealing. A few joke questions got through. He does explain the Porter decision and talks about running back by committee. In alumni news, the Redskins released Tim Hasselbeck. at Sports Moments & Memories in the Perimeter Mall I had to buy it. No angry chicken. No italicized letters. Simple. Adjustable-fitted. Perfect. It might be my all-time favorite hat. Moments & Memories is filled with all sorts of SEC and ACC tchotchkes, but not a lot of BC stuff yet. That is probably best since I don’t have to fight the temptation to buy a BC chips and salsa tray or a BC style miniature stock car. 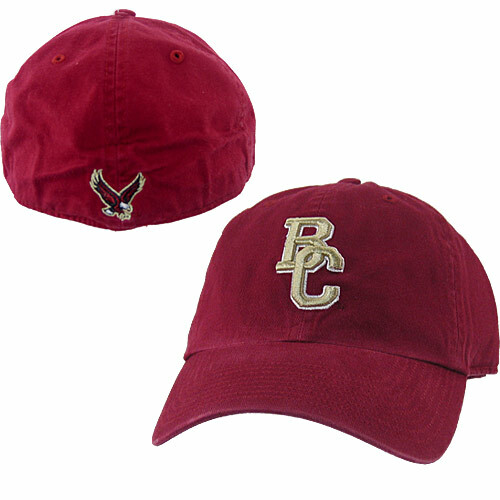 Much to my surprise they did have a foam mascot hat like these (sorry, couldn’t find a pic of the BC one). So if anyone is interested in the foam hat or the perfect hat, let me know. I might be willing to ship. Or you could just call the store yourself. My former colleague Stewart Mandel thinks BC will adjust well to the ACC. Nice pub, but there was one glaring error (which may get corrected by the time you click the link) -- he lists Blackmon as coming back as a CB. I am sure other fans will let him know. With exams and a new job at work, I’ve been busy and haven't had time to post, so here are the BC sports tidbits from the past week. First, earlier in the week, the BCS made some adjustments for Notre Dame and the Big East. The Big East will remain in the BCS for now. Notre Dame fans were upset over the reduction of Notre Dame’s upside in the BCS. I agree with the Irish fans. Why take the $1 million guarantee when the real money is in the $14+ million payout. Who knows how this BCS stuff is going to end? While the Big East is still in the BCS, BC is free to leave its old conference. Final settlement was not disclosed. Gene D. and TOB do not like the 12-game schedule. Expect home games with local DIAAs like Northeastern, UMass, Maine, URI, etc. The Alchemist and many other fans were lived with the announcement that Quinton Porter won the starting job based on spring drills. This article was BC approved, so it didn’t say anything enlightening. However, this one ends with this telling quote “Quinton understands now that there's a performance clause in all of this. You still have to perform to keep your job. It's the same for everyone looking to win a starting job on this team." Like I’ve said earlier, TOB is big on seniority and loyalty. There was no way that Porter was not going to be named starter. But TOB also knows that the bar has been raised -- by the ACC move and by Peterson’s play. If Porter struggles I expect a quick hook. Doug Flutie is back in New England. Paul Peterson is adjusting to Flutie’s old stomping grounds. In hoops news, SI’s Seth Davis talks about the college 3-point line debate. Moving it back has to help a team like BC, which has trouble defending the 3 and doesn’t depend on it offensively. Exams are over Wednesday, so look for my Spring recap later this week.